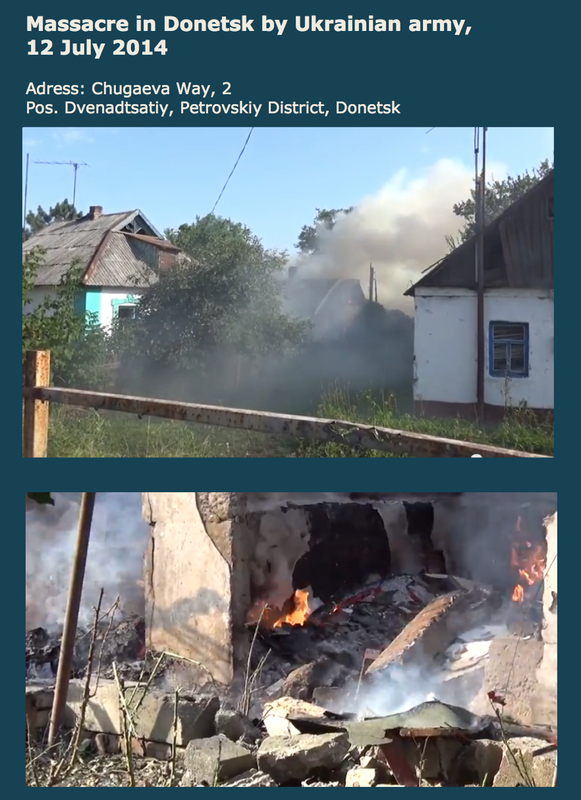 Ukraine government has exhibited a remarkably development: From severe human-rights violations to blunt war crimes. The above meaning that “West democracies”, e.g. 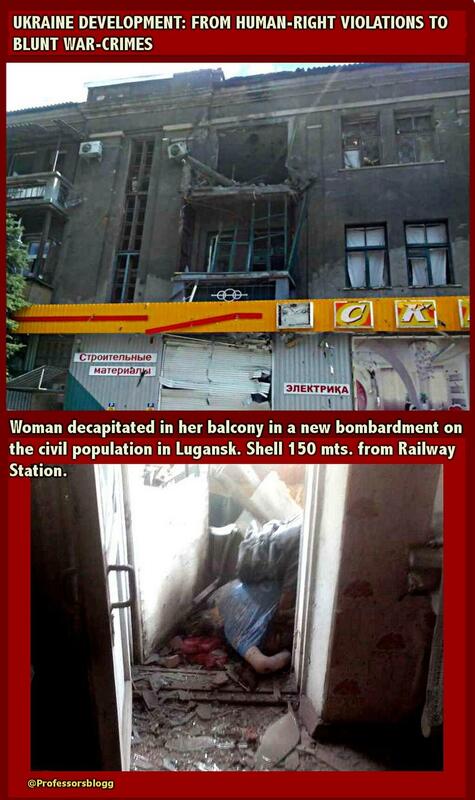 USA, or Sweden, the countries which back the Ukraine government most fervently, also exhibit the same remarkably development by fueling such anti-humanity criminal behaviour, by not condemning it, by justifying it.See for instance The US State Department publicly endorses Ukraine’s “every right” to aerial bombing the ethnic-Russian population in Donbass. 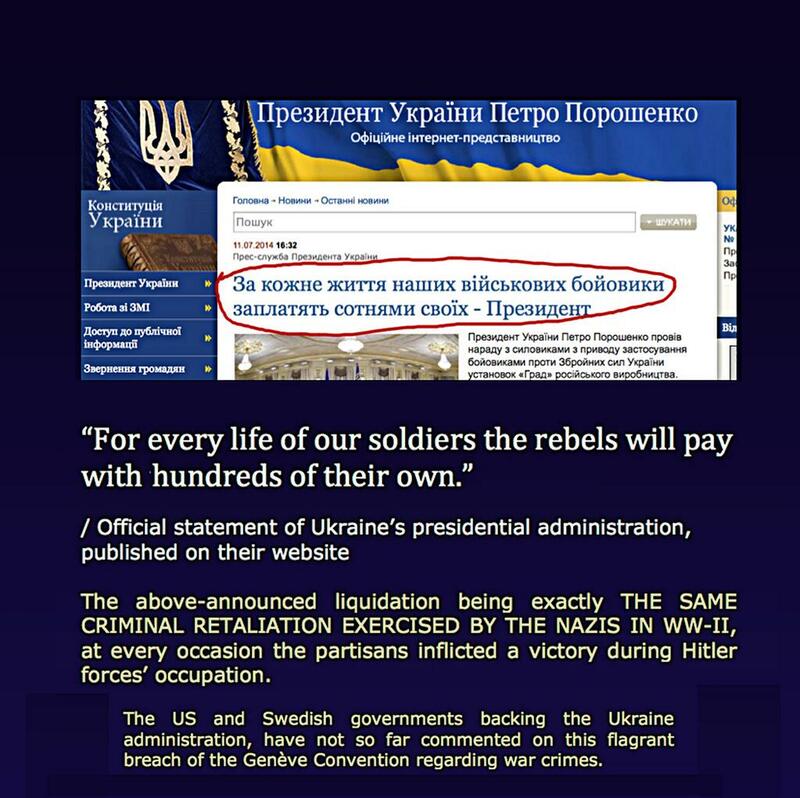 Or the Swedish Foreign minister Carl Bildt publicly endorsing the use of force by the Ukraine Junta in Donbass (Carl Bildt, violence fetishist). 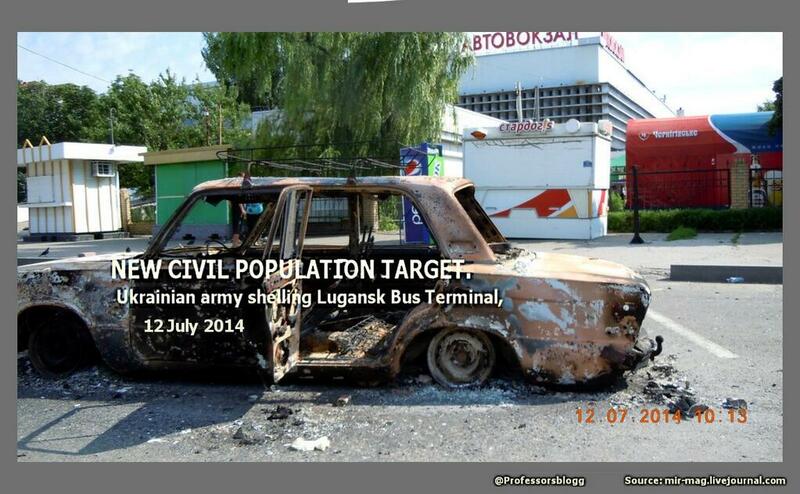 For further details and images go to Documenting war crimes in East Ukraine. A whole family massacred. WARNING for horrifying image! July 13, 2014 in Uncategorized. Viktoria Shilova, Member of the Dnipropetrovsk City Council, demands Poroshenko govt to stop the civil war. 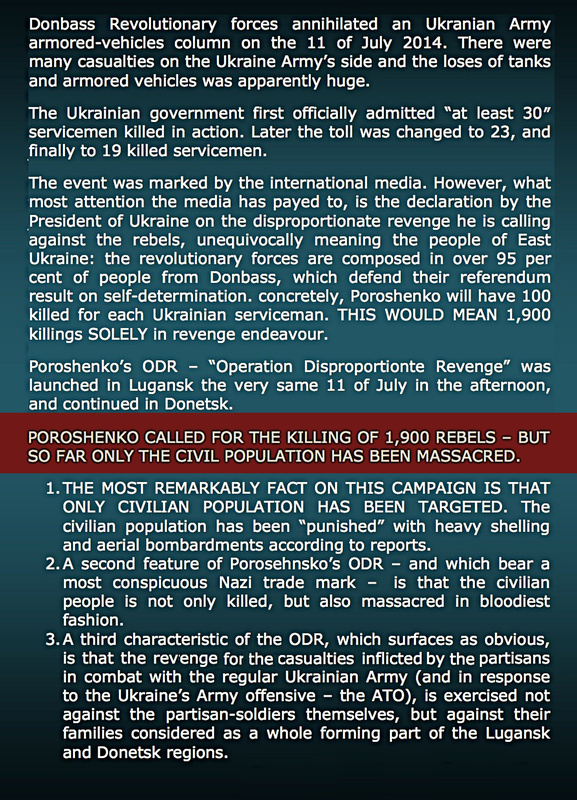 ← Documenting war crimes in East Ukraine. 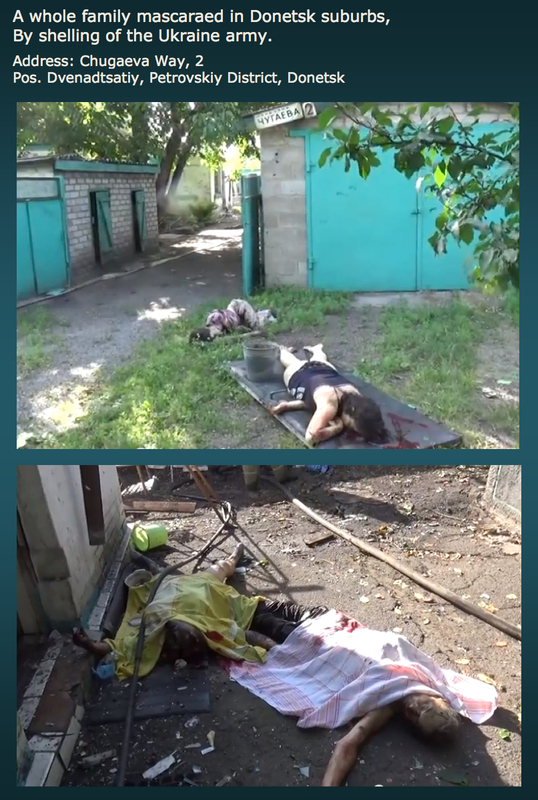 A whole family massacred in attack on Donetsk suburbs. WARNING for horrifying images! As Minister of Foreign Affairs you are representing the Dutch interests around the world. And sometimes you have to act tough in it. Especially in the current situation with the dramatic plane crash in eastern Ukraine, where no less than 193 Dutch citizens tragically died. You talked about that on July 21 during a meeting of the UN Security Council. The Dutch newspaper NRC called it “an impressive speech” of “an emotional Minister of Foreign Affairs” and published the full text in English. Of course you are, like many other Dutch people, emotionally touched by the events in eastern Ukraine with the dramatic fall of flight MH17 with tragic consequences. Also, the Dutch NOS-news, in the person of correspondent Godfroid, regularly reports in a indiscriminate and not fact-based manner about ‘theft’, the ‘removal of personal belongings of victims’ and thus contributes to a desired image by Kiev about the ‘criminal’ east. The past ten years I have often been in that area. I did research for my new book and stayed at my in-laws in the Russian Federation only about 500 meters away from the Ukrainian border. From there I went to places like Krasnodon, Lugansk, Snezjnoje, Donetsk, Kramatorsk and more places that until July 17, 2014, but few have heard of. It is a war zone now. My forthcoming book is also about war, which only took place 70 years ago. Also then the area where now fighting is going on was a war zone. In the period 1941-1944 countless men, women and children from that area were transported to Greater Germany for forced labor. The so-called ‘Ostarbeit’. Countless people lost their lives, others came back to the Soviet Union broken and were on arrival blamed for ‘high treason’. 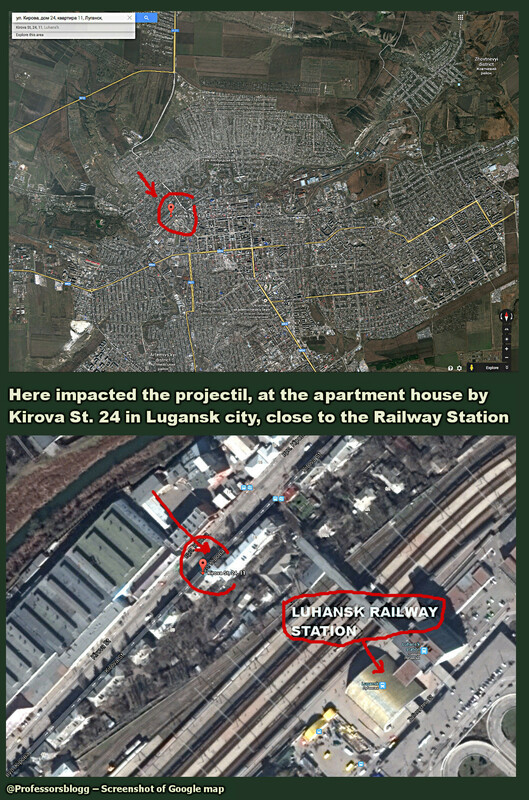 I’ve talked to a lot of people there to gather information for my book: former forced laborers and their relatives, children, grandchildren … and I got to know the people in the eastern parts of Ukraine as people with a heart of gold, who will certainly not do what Godfroid claims in the NOS news. Your speech at the UN Security Council was also broadcasted on Ukrainian and Russian television, it is no wonder that the people in the villages around the remains of flight MH17 with disbelief and emotionally reacted to your words.